May your day be filled with all good things, the love of family and friends, the laughter of children, presents, Christmas Trees, good food and better company. Here’s hoping that 2016 will bring you everything that you need and more than you might wish for. dry , may the sun shine and the breeze be always gently at your back. 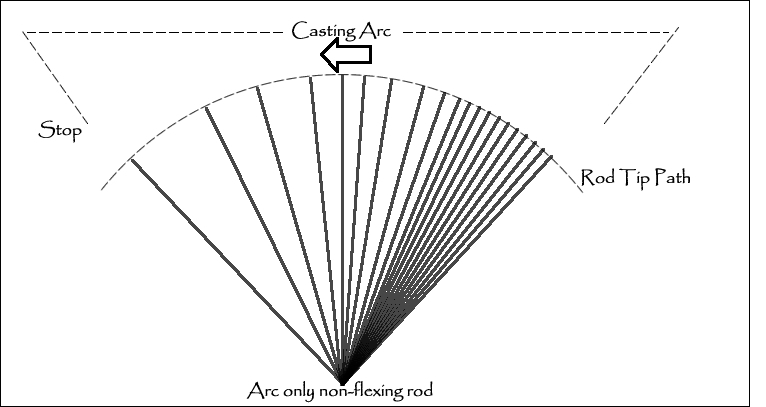 This is the third of a series of articles written for Vagabond Flyfishing Magazine , this one a little more detailed still and focusing on the relationship between rod flex and casting arc. 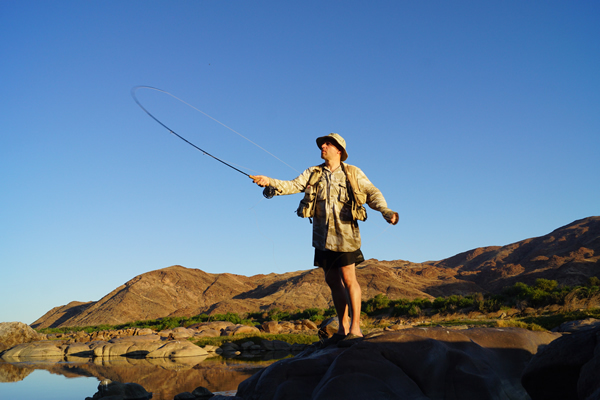 You can’t escape it, fly fishing is about fly casting, or at least that is the starting point. So in the next few pieces for Vagabond I am going to be looking at some structure in terms of what makes fly casting work, what is happening when it is going wrong and how to fix it. So this and other articles on casting will also appear on The Fishing Gene Blog, for the benefit of those yet to discover Vagabond. Following on from the previous articles some slightly more advanced thoughts on the mechanics of fly casting. 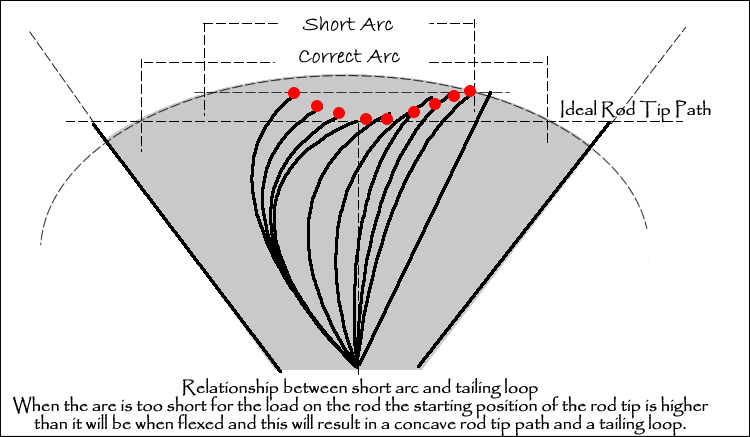 Last time we looked in some detail at the concepts of arc and stroke, the basic movements of the fly caster and those which ultimately determine the track of the rod tip and thus the movement of the line and shape of the loop. Trouble is that with fly casting, unlike any other form of casting in different types of angling, one is not casting a constant mass; the weight of the line cast varies all the time as a function of the length of it out of the rod tip. 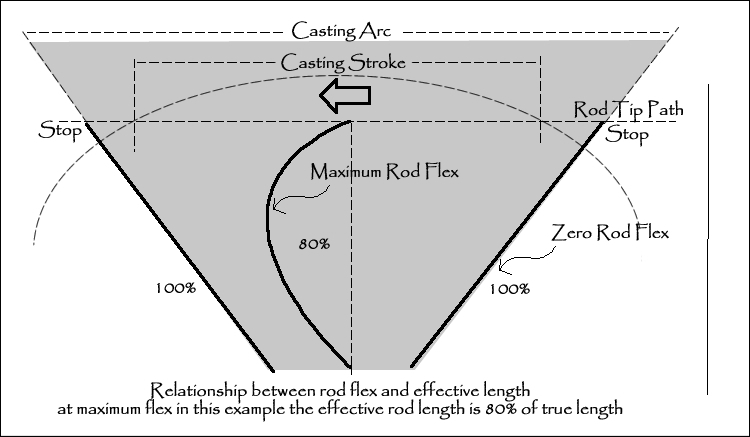 So how does that change the structure of the casting stroke? The issue here is that the more line out the more weight and the greater the inertia and it then follows that the rod will load more (bend to a greater degree). In effect then the rod gets shorter under more load and flex, “The effective rod length”. If one is aiming to move the rod tip in a straight line the starting point of that straight line is the height above the caster that the rod tip finds itself when bent. The more bend the “lower to the ground” the starting point of the stroke and thus the wider the casting arc has to be. Now that isn’t very easy to explain in words but perhaps a diagram will assist in understanding. Images are copyright protected and generously provided from Tim’s latest book on casting which is still in the process of being completed. In the above diagram the rod has been bent to 80% of its original height above the angler. So the correct point to start the stroke is with the rod at an angle which starts the stroke with the rod point at this height. In other words the starting point is where the tip of the rod at zero flex is in line with the tip of the rod under maximum flex.. If you let out more line, or to a point apply more force the rod will bend more, the effective height above the angler will reduce further and the starting point of the stroke will have the rod at a greater angle. Above, you will note that as the rod bends more deeply the starting point of the stroke is at a greater angle, and the width of the casting arc becomes greater. More line out requires a greater arc and longer stroke. In addition to the above obviously the more line out the more power that is required , but one of the absolute keys to casting a fly line is to adjust the arc and stroke as the amount of line in the air changes (or as the amount of rod bend changes if you wish to think of it like that).. For the most part anglers adjust this naturally but understanding the relationship is the key to spotting the cause of some faults which may appear in your casting. So what happens if you don’t get the adjustment correct? Although there are more than a few ways of creating tailing loops, those annoying squiggles in the line which look remarkably like the ebola virus and which can be as devastating to your casting, resulting in tangles and wind knots in your tippet. Virtually all of them stem from the rod tip dipping down below the ideal line and then flipping back up again. Failure to extend the arc and stroke as you let out more line will cause the rod tip to do precisely that, dip down and climb back up again during the cast which will result in the line doing the same. 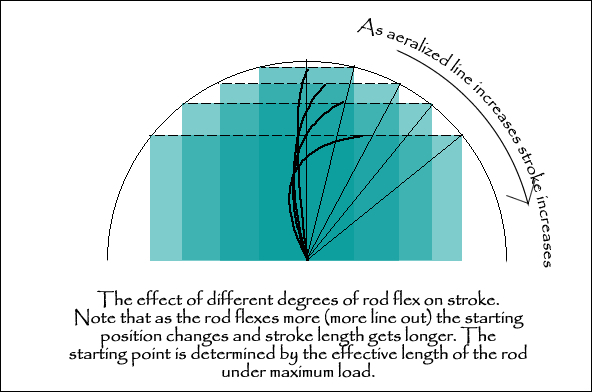 In the diagram above one can see that based on the amount of flex in the rod it should have started “lower” and the arc should have been wider. Now the rod starts in the incorrect position, the rod tip bends down as it loads and then springs back up during the cast producing a tailing loop. This isn’t the only way to get a tailing loop but all of the various faults that can cause one are based on the same thing. The rod tip dipping down in a concave arc and climbing again. Next time we will look at a couple more ways that you might inadvertently produce the same effect and create wind knots in your line. This is the second of a series of articles I have written for Vagabond Flyfishing Magazine , this one a little more detailed and focusing on essential elements of a good cast. You can’t escape it, fly fishing is about fly casting, or at least that is the starting point. So in the next few pieces for Vagabond I am going to be looking at some structure in terms of what makes fly casting work, what is happening when it is going wrong and how to fix it. So this and other articles on casting will also appear on The Fishing Gene Blog, for the benefit of those yet to discover Vagabond. There are many different ways and styles of teaching (and thus learning) casting, but there are equally a number of indefatigable truths about what works and what doesn’t. Sure you might prefer to have one or other leg forward, or use your finger, thumb or palm of your hand on the handle, ( I have my own opinions, which I am not going to share here). You may like to have the rod at something of an angle or favour those which are faster or slower in their actions. But the mechanics of good casting are an absolute given. This isn’t art, this is science, fly casting is pure physics and as such obeys critical scientific laws which aren’t going to change any time soon. Not that one need to take a scientific approach, just that the laws of mass, acceleration, energy storage, resistance and such will directly affect the result. I can’t change that and neither can you. So what makes a good cast anyway? The very simple answer to what could become a complex question is that a good narrow loop makes for a good cast. We aren’t going to concern ourselves at present with the idea that occasionally one might wish to throw a more open one, good loops are good casts. Practice getting good loops and you will by default have good casts. Note: The “loop” is the rounded link between the two legs of the line as the line unrolls in the air, looking rather like the tracks of a tank in motion. The closer together the legs the “tighter” the loop and the better the cast. So then, what makes for good loops? The movement of the rod tip controls the loops, sure you can argue that the movement of your hand , arm or whatever control that tip movement but the line doesn’t know a thing about that. The line only knows what the rod tip does and follows suit. Move the rod tip in a straight and accelerating line and the fly line will unroll in a neat tight and efficient cast. Move the rod tip in a convex path and you will have a wide and inefficient, wind resistant cast lacking momentum and carry. Move the rod tip in a concave path and you will throw tailing loops, those annoying squiggles which catch your fly in the line and produce wind knots in your tippet. And you may well then ask what makes straight, convex or concave rod tip paths, and the answer to that question is YOU! When you cast, move the rod using your hand on the handle, you can effectively do two things, you can “flex” your wrist, (It is what casting instructors refer to as “rotation”) , and don’t be too quick to tell everyone that is bad, because it isn’t. Or you can move your wrist “forwards and backwards” which is what instructors call “stroke”. If you want to think of it like this, rotation is like flicking a marshmallow off the end of a stick, (speed). Stroke is like punching someone in the stomach (linear acceleration). A good cast involves both of these motions. If you rely only on rotation, you will have a massively convex rod tip path, (less so if you are using a very soft rod). On the other hand, if you rely on only stroke you will not be able to achieve much by way of acceleration. That said the vast majority of anglers rely far too much on rotation and focus far too little on stroke. If you simply move your hand forwards, as in punching someone in the stomach, should you move your hand 30 cm in a second for example you will move the rod tip 30cm in a second. However if you rotate your wrist by a few degrees of arc, (when you do this is important), you will move the rod tip considerably more than 30cm and in a lot less time too. Whipping out my rusty maths, a 30° rotation of a nine foot rod will move the tip 4’6”. It should be obvious that you cannot move the rod tip that far using only stroke, not unless you have very long arms. It is perhaps important to make note at this point that when I say “move the rod tip” and “speed” I mean that the rod tip would move that fast were it not bendy. But of course the rod is bendy so instead of the tip moving rapidly to start with it stays relatively still and “stores” the energy that you have put into it, held back by the inertia of the line. It is this storage of energy as much as anything else that makes it possible to cast easily with a fly rod. “Rotation” of the wrist then is actually a critical part to loading the rod to best effect and all these dire warnings about “breaking your wrist” are so much hot air. You cannot cast well or effectively without breaking your wrist or rotating your wrist, the more important bit is how much and when you do this. 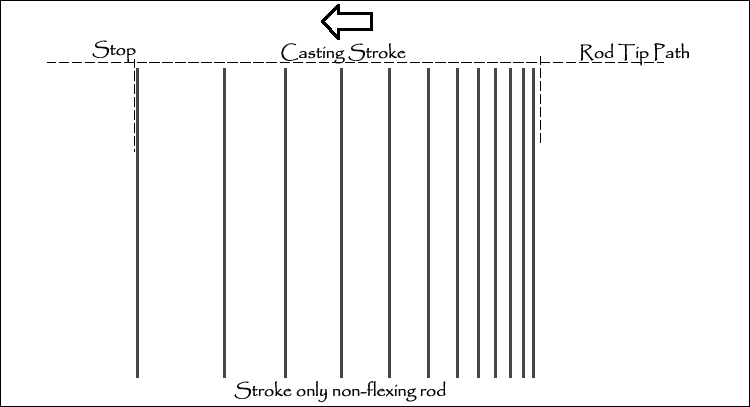 Stroke is the linear movement of your casting hand to affect a long and straight rod tip path. Without stroke you will always have a convex rod tip path and a less effective cast as a result. So in Image One, below you can see the effect on the rod tip of only using rotation. In this instance the rod is imagined not to bend to clarify things. The more the rod would bend the less obvious would be the convex nature of the rod tip path. Shows the effect of only using stroke, again an imaginary unflexing rod. Finally the combination of rotation and stroke as it occurs in a real cast (exaggerated). Initial rotation loads (bends) the rod, and accelerated stroke keeps the rod loaded and adds a little more bend and then final rotation adds even more bend to the rod until it is fully loaded. When at the far left of the image you stop or pause, the loaded energy in the rod launches the line in a nice neat efficient tight loop. A combination of rotation and stroke, providing high line speed, maximum loading of the rod and a straight and accelerating rod tip path. This is one of the reasons why attempting to “Throw” the line doesn’t work, as the caster you can only load the rod, in reality most if not all of the actual “throwing” gets done by the rod itself as it unloads. So if you are starting off or trying to improve your casting, the first thing to do is to look carefully at your casting, does it contain both rotation and stroke? Is the stroke long enough? It probably isn’t. Better still have a mate watch , because it isn’t easy to see for yourself, best yet, get some lessons. To see a graphic illustration of the combination of stroke and arc in a cast take a look at www.inkwaziflyfishing.co.za the animated graphic at the top of the page illustrates the principle quite well. In the next article we will look more deeply at that overall casting stroke, why the length of the stroke needs to change with line length and why if it doesn’t you will end up with tailing loops.